Who Gets to Call Themselves a Poet? The flippant answer to this question is also the real answer: anyone. Everyone. You. Poet is not some mystical status to which one can ascend only after years of study or initiation into some secret club. It doesn’t require you to wear a black turtleneck and mope around, or to live in the woods and grow a wild beard like Whitman. It doesn’t require you to belong to any particular social group, race, religion or sexual orientation. To be a poet requires only that you read and write poetry. Simple as that. Immerse yourself in poems, play with language, make stuff. The external measures — having your work published, earning an advanced degree in creative writing, winning poetry slams, seeing your poem go viral on Twitter — it would be disingenuous to pretend those things don’t matter. We live in the world, after all, and we all value recognition and praise. So, sure, they matter. But they don’t decide whether or not you are a poet. They don’t decide whether or not you get to make art. As teachers of poetry and evangelists for the genre, it’s part of our calling to demystify poetry. To reduce the reservations people have about poems and their relationship (or lack thereof) to poetry. To help people find their own path to the artform, to connect with poems, to see what’s possible and what’s beautiful in poetry. To help them see themselves as poets. We are well aware that too many people have been taught that poems are inscrutable riddles, locks to which only teachers hold the key. To which we say baloney. Poems are meant for readers, and no poem has only one potential meaning, and every reader is allowed to have their own experience with a poem, and no teacher should call that experience invalid. This is not to say that poetry isn’t challenging. Certainly, it is. But this is a feature, not a bug. A key feature of poetry is the way that poets seek to use language in new, surprising ways. That’s the definition of poetry: building art out of language. Pushing against the limits of what language can achieve; finding new ways to explore and express the complexities and beauty of the human condition. Every artistic medium has its limits — you can’t smell a film, can’t hear a sculpture, can’t taste a painting. It is the work of the artist to overcome those limits. To suggest these sensations through other means. A painting of a sumptuous meal relies on sights and textures, colors and shading to evoke taste and smell. The same is true of poets and language. A love poem is not love, and yet it must evoke love. An elegy is not the physical reality of grief or loss, and yet it must explore that sensation through language only, through symbols on the page. It’s only natural that this creates tension, that it pushes language into unfamiliar places. Poems ask a bit more of their readers than prose does. Poems ask us to sit with them a bit longer, to consider them more carefully. A poem should not be skimmed and cannot easily be paraphrased. As teachers of poetry, we encourage our students to embrace the uncertainty and slipperiness of language, to revel in the discomfort that comes when reading a poem that challenges them. And to learn how sometimes being a poet is about writing a poem and being okay with not being 100 percent sure of what you are doing. The human condition — what it means to be alive — is full of such slipperiness, doubt, strangeness, absurdity, difficulty. And language can go only so far in expressing these things. But that’s what’s so exciting about poetry. Pushing on the boundaries of the work words do, exploring our emotions and experience, expressing ourselves. And that’s something anyone can do. Amorak Huey is author of Seducing the Asparagus Queen (Cloudbank Books, 2018) and Ha Ha Ha Thump (Sundress Publications, 2015). W. Todd Kaneko is author of The Dead Wrestler Elegies (Curbside Splendor, 2014). 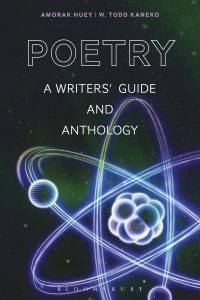 Both of them teach at Grand Valley State University in Michigan, and their book Poetry: A Writer’s Guide and Anthology is available from Bloomsbury. It is premised on the belief that anyone can be a poet. Thank you Todd and Amorak. This is art. I often think of process not product. I thank you for reminding us that “to be a poet requires that you read and write poems.” Pretty simple. And there is so much wonderful poetry out there.